Arron K Renfrew started his Real Estate Career under the wing of his father and mother who invested in Real Estate from the Time Arron was a small boy in Issaquah WA. He worked with his father maintaining properties and learning the value of Real Estate. Arron has stated, "My Father was my Mentor and I learned a tremendous amount about every aspect of Real Estate from him." Likewise Keith W. Renfrew often states, "I have learned a great deal from my son and it seems everything he touches, turns to gold." Then after Graduating from the University of Washington. Arron entered the very different world of Seattle Real Estate. It is there that he has taken the skills and life lessons he learned from his father and has applied them to helping others and building a very successful Real Estate Career. 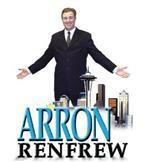 Arron Renfrew is known in the industry for being highly motivated and a high achiever. Having sold over $500,000,000 Five Hundred Million Dollars in Real Estate (and counting) he has already sold more than 95% of the competition ever will and he is still going. Arron's key to success is growth and helping people achieve their dreams and goals. Some of the activities that Arron likes to participate in are Fly Fishing, horseback riding, hiking and even sometimes a little golf. He says that this gives him an opportunity to better know the northwest and all that it has to offer for his out of town clients. John Curly of King 5 Evening Magazine and Arron Renfrew of Renfrew Real Estate on the ms Amsterdam enjoying a conversation at the Washington State Mentors, Champions of Mentoring Benefit Auction and Luncheon. Renfrew Real Estate is a proud supporter of the Washington State Mentors. Want more information about how you can participate? Click the picture above. The Renfrew Real Estate Group and Arron Renfrew believe in helping others and giving back to the community. That is why a portion of the proceeds from every home sold goes to charitable causes that help people in our local community. Several non profits, church groups, and people in need are served. One of the organizations that we personally support and helped to create is The Catch a Dream Foundation. The "GOAL" of the Catch A Dream Foundation is to provide support to local neighborhoods and communities where we work and live. The Catch A Dream Foundation was established to help and assist as many individuals and organizations no matter how basic the need, including to help them realize their dreams. Arron Renfrew contributes every month to this non-profit charity. The foundation´s duties range from managing the contributions through meetings, deciding who the recipients will be and how much will be donated and in many cases, physically delivering the donations to the individual or organization. We provide Gift Cards to families who´s spouses were in Iraq, so that they could purchase gifts for the holidays. We also sent out care packages to the individuals who were away. We collected truck loads of food and delivered it to the food bank´s in our area. Catch A Dream has given in the past to the Forgotten Children´s Fund, Drug Addicted Newborns, Pediatrics Interim Care, Homeless Centers, After School Programs, Food Banks, Women and Children Shelters. We are proud to be a part of this community and hope that we can help others in the community Catch their Dream! If you know someone in need or would like to be a part of the giving... Please call Arron Renfrew to find out how you can help.